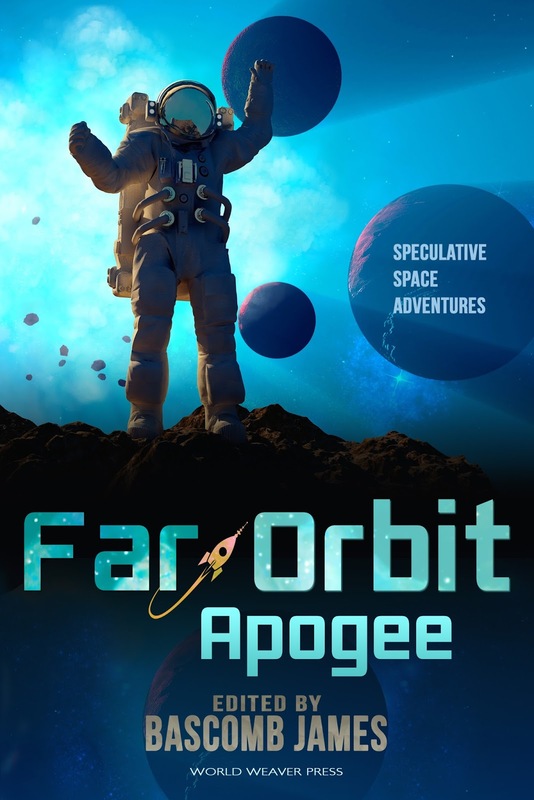 Alpena, MI (October 13, 2015) – World Weaver Press (Eileen Wiedbrauk, Editor-in-Chief) has announced Far Orbit Apogee,volume two of the Far Orbit Anthology Series, edited by Bascomb James, is available in trade paperback and ebook today, Tuesday, October 13, 2015. Looking for science fiction stories like they used to write? Far Orbit Apogee takes all of the fun-to-read adventure, ingenuity, and heroism of mid-century pulp fiction and reshapes it into modern space adventures crafted by a new generation of writers. Follow the adventures of heroic scientists, lunar detectives, space dragons, robots, interstellar pirates, gun slingers, and other memorable and diverse characters as they wrestle with adversity beyond the borders of our small blue marble. Featuring stories from Jennnifer Campbell-Hicks, Dave Creek, Eric Del Carlo, Dominic Dulley, Nestor Delfino, Milo James Fowler, Julie Frost, Sam S. Kepfield, Keven R. Pittsinger, Wendy Sparrow, Anna Salonen, James Van Pelt, and Jay Werkheiser. Far Orbit Apogee is available in trade paperback and ebook via Amazon.com, Barnesandnoble.com, Kobo.com, WorldWeaverPress.com, and other online retailers, and for wholesale through Ingram. You can also find Far Orbit Apogee onGoodreads. Bascomb James is a clinical virologist, author, and editor who lives in Ann Arbor, Michigan. His daytime persona has authored or edited four scientific textbooks and more than 60 scientific articles and chapters. His nighttime persona is an author, editor, and science fiction fan. Bascomb is the anthologist and editor of the Far Orbit anthologies published by World Weaver Press. The first Far Orbit volume, Far Orbit: Speculative Space Adventures was published in 2014 and has garnered many outstanding reviews. A science-fiction fan since childhood, Bascomb credits his interest in science, engineering, and invention to the science fiction stories he read as a child. Bascomb blogs about writing, editing, storytelling, and life in a Northern state (Up North Stories) at bascombjames.com. He also tweets occasionally @BascombJ.